Brunch, glorious brunch. What used to be simply known as a mixture of breakfast and lunch, nowadays is a regular feature and highlight of the weekend for so many. Our wonderful brand ambassador Roz Purcell created a super easy Pre-Match Brunch to fuel your day, that you can whip up in the comfort of your own home! Roz paired our Cauliflower Hash Browns with homemade beans, delicious tofu scramble and avocado, to bring it all together! Scroll down for the full recipe and method and be sure to check out her website Natural Born Feeder for more delicious plant-based recipes! You’ll also find her on Instagram @RozannaPurcell and @NaturalBornFeeder! Happy Cooking! Preheat the oven to 200°C and place the Cauliflower Hash Browns onto a lined baking tray and bake for 15-17 minutes. In a small saucepan over high heat, add all the bean ingredients and combine well. Bring to boil and cook for 2 minutes. Remove from the heat and set to one side until ready to use. For the tofu scramble, in a deep frying pan add the oil and tofu, using a fork break up the tofu into a scramble. Add all the other ingredients and combine into vibrant yellow colour, cook for 2 minutes. Turn off the heat and stir in the spring onion. 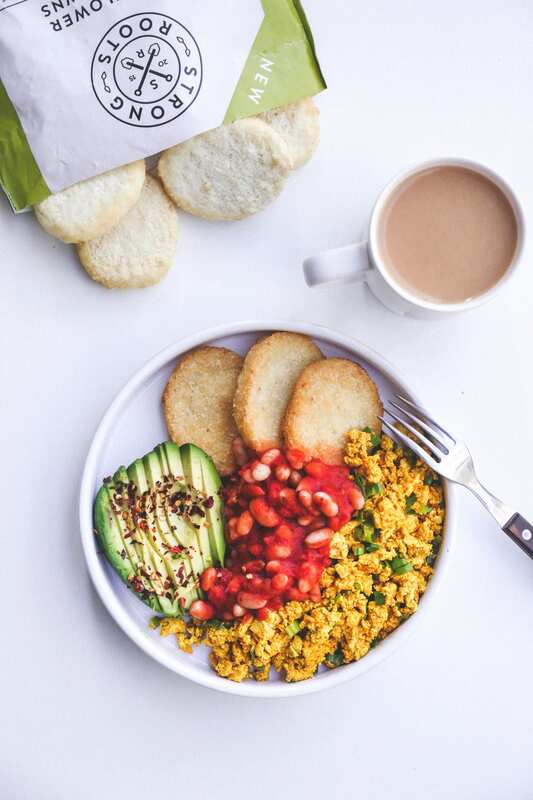 Serve the hash brown with the scramble, beans and a sliced avocado for the ultimate vegan feed.